I had been aiming to finish this by the end of May, but 1st of June is good enough. It turns out I didn't mind moving straight from quilting to piecing and there is definitely satisfaction to be had from finishing something in the same year as it was started, which doesn't happen all that often round here. Inspiration taken from images of Findhorn Bay and the list of bird names recited by my friend Sue as she was describing it to me. Flying geese, the rays of the sun, the spread of a bird's wing. A close-up carefully selected to include one of my grey hairs! I have to say, I am very, very happy with how this has turned out. I love the shapes and the colours and generally feel jolly pleased with it. Started piecing 20th March, finished 4th May 2018. Started quilting 5th May, finished on 1st June 2018. Made using a selection of shirts, plus fabrics from stash and the scrap box. The purple is an Oakshott cotton and the gold is Cloud 9. The binding is made with leftovers from one of the shirts. Hand quilted using Aurifil and Madeira lana threads, and the wadding is So Simple SuperSoft Eco Blend. I love the shapes and the colors too! Gorgeous, with your beautiful quilting! I love it! You’ve caught the colours of Findhorn (as I remember them) beautifully! I love the crumpled poses like the quilt would be if in your lap -- lovely hand quilting!! Wow, this came together so quickly, Kaja, and I love how the inspiration can be seen from details in the piecing to the quilting. Beautiful finish Kaja, love the reason for making and how you've quilted this lovely small (for you) piece! This one is special....i like it a lot! soooooo interesting. How did you do the words? I like the back too. Nice addition in your friends' house. Am sure it will be well received and it is lovely but tell me please …..
My covers and quilts all have cat hair accompaniment! You are a master at putting these types of quilts together. I don't even know what you call them. Improv? Whatever. This one is beautiful and you know what it has been reminding me of all along? I didn't want to say it until it was done, to be sure of the final appearance, but it looks like an indian headdress to me. Appropriate too, because of the bird names, and so . . . feathers! Beautiful and brilliant...be so very proud !!!!! LIke everyone else, I am thrilled with your finished quilt. Masterful. The multiple rows of arcs remind me of a giant bird's wing as she lands on the water. The smaller flying geese are large flocks in the distance. I love how you merged these aspects: closeup and distance view, single and flock with the colors of water and sunrise. So, so lovely Congratulations. Fabulous piece! You should definitely be proud of it. Love the colors and lines. Congratulations on this finish. It turned out wonderful! This is simply fabulous! I love the detail and energy to this particular quilt. I'm kind of sad at how small it is, but I'm sure it's perfect for the specifics of who/why you made it in the first place! What a beauty! I love the colours and textures in those shirtings. Great, and Fast, finish! 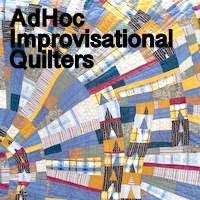 Both beautiful and inventive - I love your quilts. What a fabulous finish! Really love the sense movement! Is this going to the friends of yours who moved to Findhorn Bay? Beautiful! Not matchy matchy which I find absolutely freeing and inspirational. Thank you for detailing all your progress and components. Bravo and Blessings! such great movement in this. I nearly think I can see birds' feet tripping across this. And I love the sunburst in the quilting. It's wonderful. Every decision you made along the way was the right one. You are an amazing concept artist.